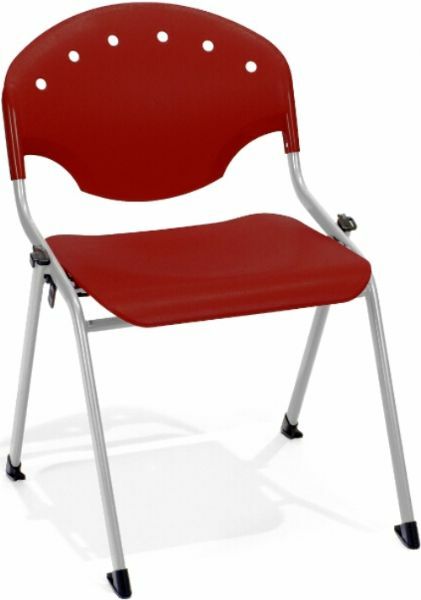 OFM 305-12-P17 Rico Stack Chair, 17.75" Seat Height, 21.75" x 22.75" Base Size, 20.50" W x 13.25" H Back Size, 18.25" W x 16.50" D Seat Size, 300 lbs. weight capacity, Stacks 15 high on dolly, Built-in ganging brackets, No assembly required, Silver powder-coated painted steel frame, Burgundy Color, UPC 811588013616, Greenguard Certified for Children & Schools. Base Size 21.75" x 22.75"